Why Can't I Do It Alone? This past weekend, I attended the Women, Action & the Media Conference (WAM!) in Boston. It was a really great event with informative panels and inspiring media-makers. A lot of what I took away from this weekend came from the sessions I attended. The panel about gender, non-conformity and the media really made me question how we view gender, and echoed a lot of my own ambivalence about labels. A workshop about self-publishing not only gave me practical skills I can keep in mind and share with other writers, but also reaffirmed the importance of advocating for yourself, putting your work out there, and learning how to fight for the creative control you desire. In another session, I saw a short film entitled Not Yet Rain about the realities of abortion access in Ethiopia, inspiring me to become more involved in public health and human rights around the world. The most important thing I got out of the conference was a stronger confidence in my own work. As you would expect at an event like this, I often had to explain to people what I do, and I got to share my love for activism and writing with almost everyone I met. I really got a sense that these were my kind of people, so hearing their support of my work and sometimes even their open admiration was very validating. The thoughts I've been having lately about whether or not any of this is worth it quickly flew out of my mind after my first night at WAM! I spent the rest of the weekend trying to soak in all of the advice and affirmation I could. Even though my trip was exhausting, it was such a good experience, and I wouldn't have changed anything about it. The things I learned and the self-confidence I gained were enough for me to get my money's worth. But my favorite part was meeting the people I've been building relationships with online through blogs and on Twitter. They're even more awesome in person, and we all got along very well. I also met a lot of new people, and learned things from every one of them. I can't wait for the next conference! On Saturday, I attended The Women’s Mosaic’s spring Visioning Workshop. 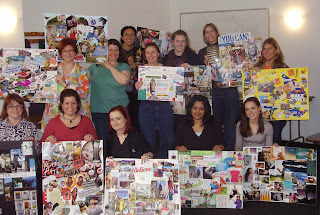 Visioning is an intensive personal collage-making process that inspires people to use creativity and intuition to tap into their subconscious dreams and desires. The goal is to capture images – abstract or literal – that represent the life you want; by interpreting and embracing those images, you empower yourself to make the choices that will lead you there. I’ve participated in quite a few visioning workshops over the past five years, and each time, the collage process seems to have something different to offer. Sometimes it manages to invigorate or refresh me. Other times, it leaves me feeling reflective. Or inspired. Or challenged by the thoughts that surface when I really give myself time to be alone with what I feel. The magic of visioning, for me, lies partly in its familiarity, but just as much in the fact that you never can know exactly what to expect. The point, of course, is to reach inside yourself and grapple with questions like “What do I want?” and “How do I get it?” without allowing yourself to pre-judge or discredit the answers based on so-called logic or practicality. When I’m able to enter the visioning space with a truly open mind, I never cease to be surprised by what emerges. At times it can almost be as powerful as seeing yourself through new eyes. When I look at my latest collage, I see spaces of beauty. I see strangeness, and passion, and promise. I see adventure – not the reckless kind, but the kind that unfolds slowly and fills you with richness. I see myself at a moment in time where there are many possibilities, but many uncertainties. Where there’s a delicate balance between things hoped for and things earned, between embracing the things that truly define me and recognizing the things I allow to represent me that are merely shadows. It seems these images are telling me to get out in the world and just be me. Do you have a Visioning Workshop story? Even if you haven’t done the workshop, what do you see when you picture the future? For the final Friday Forum celebrating Women's History Month, we want to know what hopes you have for our daughters, granddaughters, great-granddaughters and so on? What do you want for the women of the future? 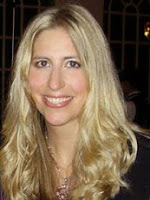 Join her at TWM's Visioning Workshop this Saturday, March 28. See her speak for free April 4 at Equinox when she presents: Spring Cleaning for the Soul. In our Spring TWM eNewsletter, I thank the Women Warriors of the past for getting us to a place where we can now truly be whoever we want to be regardless of our gender. I think we are entering into another phase of being ‘women warriors’ in the broadest sense of the word - we are fighting for the right to live the lives we want – for our ability to be in touch with our deepest desires and having the courage to obtain them; to express who we are and what we want in a most unapologetic way. I’d like to think of the term “warrior” here as a concept for forging our own path, regardless of what the outside world is telling us we should or should not be doing, can or cannot achieve. Now is the time to fight for your Self to fully exist. It is a time to be strong and fight for yourself like a mother bear would fight for her cub; to make your life your own, a work of art; to craft and shape it in the way that suits you best and fits your own personal definition of beauty, fulfillment and happiness. Only when we do that can we really become warriors for others, which won't always have to be in an external way - simply by exercising our right to be who we are allows others to do the same. It has taken years of struggle and sacrifice from thousands of women warriors before us to push through to this point, where we can be the full contributors to society we are meant to be. Let us be so grateful that we do not have to deal with the severe limitations of the past and can determine our own destiny in every area of our lives. I don’t know about any of you, but I personally get caught up in my own thoughts, sometimes to the point where I have to kick myself back into the real world. I go through these phases where I move through the daily routines of life in an almost robotic fashion, but my mind is swimming with thoughts of other places, other situations, and other people. Maybe it happens when one is in a rut, or maybe it's just me, but I know that too much escapism is not a good thing. Ever since I was a child I had a very active imagination, and it served as an escape from the peer pressure and meanness of my fellow classmates at school. I was too sweet, too sensitive, and too brown in my small Catholic school class, and the other students and a few teachers took advantage of these “shortcomings” for their own reasons. When family life got to me at the same time, there was nothing I liked better than reading a great book, watching a good movie or TV show, or just writing little stories and drawing sketches to immerse myself in my fantasy world. I could handle my dreams; reality was harder to deal with. Even when I went to college, met better people and had more positive experiences, I would find myself getting swept away by my imagination at times. Some people don’t surrender so easily, but I have been known to do so on certain occasions. The Internet has become a major source of my temporary escapism, which we all know can be very addictive. I have to use the Internet for work, but I have to discipline myself more to resist the temptations that the World Wide Web has to offer. It is too easy to waste time looking up random (sometimes useless) information. Can you relate? How do you reconcile the realities of life with your imagination? As I've said in before, I'm currently engaged to a guy I love very much and love spending time with. It's great fun, but sometimes I like doing fun things on my own. So, for the past few weeks, I've been doing more by myself. I've eaten out, gone for walks, and other things I could probably do with somebody else, but just really like doing alone too. Usually, nobody really pays attention to me. I just blend in with the background or they assume I'm waiting for somebody. The only time this is not the case is when I go to the movies alone. Loud gasps all around, oh the horror! - I know. I go up to the ticket counter and ask for one ticket, get whatever snack I want ("just one, thanks"), and find a seat without worrying if one of them is taken. The first time I went to the movies alone, I thought I was imagining it, but now that I've done it more I'm convinced that some people are really surprised to see me alone. I once spoke to a single friend of mine who seemed embarrassed at the thought of going to the movies alone. She could do pretty much everything else on her own, but the movies? No way! That's just... weird! Only lonely, old people do that. Even when telling my guy about going to the movies alone, he suddenly acts as if this somehow means I'm lonely and he's neglecting me. I don't really get it. Is it just me? In college there were a couple of times when I went to the movies on my own. If it was going to be a hassle to coordinate with other people and I really wanted to watch something, I went. Why is it such a big deal, why can't I do it alone? Does any of you have something you do on your own that people usually do in groups? Do you find that being in a relationship increases that expectation? A while ago, Pauline posted about battling clutter. My space, too, tends to get crowded with books, papers, clothing, etc. New York City apartments are small, of course, so it’s instinctive to think that there just isn’t enough space. But really there’s just too much stuff. Much that I probably don’t need. With the economy the way it is, I’ve been careful lately about my purchases, which I think has made me more aware of the things I already own. Browsing in the bookstore last weekend, I bought a book about organizing and clearing out clutter. It advocates drawing a pretty harsh line between what you actually need and use, and what is extra. Seems great, right? Everything would be streamlined if I followed these directions. But at a time like this, when I still want to be careful about what I buy, I also want to be careful about what I throw out. We pack-rats save stuff for the day when we might need it. Or for the day when we might not be able to get it elsewhere. It kind of feels like those days could be coming. Let’s hope not, but how do you justify getting rid of potentially useful things (clothes, etc.) when money is tight? As we continue Women's History Month, we want to reflect on the activists who came before us and got us to where we are now. With that in mind, how connected are you to the feminist/womanist/humanist movement? Do you identify with any of these labels? Why or why not? For all of those who'll be in NYC on March 31st, please be sure to stop by our new monthly meet-up! In Celebration of Women's History Month: I Am Woman Hear Me Roar! On March 31st, come by to celebrate all that it means to be a woman at the culmination of Women's History Month! Say hello and connect with friends old and new while learning more about TWM & CHICKS ROCK! in the back lounge at SideBAR, located at 118 East 15th Street at Irving Place just off of Union Square. If you're on Meetup, RSVP here. Or simply send an email. If you can't make it this month, don't worry! We've got meet-ups lined up for the next few months. There is no question that the domestic and international economic situations are pretty grim. With the highest unemployment rate since the early 1980s, many people are lamenting the current crisis and fearing it will last longer than expected. While I understand the situation and know people who have been laid off or lost property during these difficult times, we cannot give in to despair. We have to think “outside of the box” to survive during this recession. It's easier said than done, because we are all used to our routines and regular paychecks, but I think it is the only way we can weather this economic storm. This means exploring other careers in other fields and industries we may not have thought of doing before. I recently spoke to someone who lost his job working in a dentist’s office and decided to start his own remodeling and construction business. He put his creative skills as an artist and his experience with home improvement projects to good use by working on a variety of jobs for many clients at the same time. He is feeling the effects of the recession like all of us, but is still doing well because he's flexible and willing to compromise. People looking for specific jobs in specific fields, such as finance and communications, find themselves in fierce competition with more candidates than ever before. I recently saw a report on television about how many men have lost their jobs, while many women are still working, for less pay. One man has been home for almost a year after being laid off from his financial securities position, which he had for almost twenty years. He has been sending his resume to various financial institutions everyday, hoping for the best. In this case, the man with the MBA is not faring much better than the high school graduate. Stories like these inspire me to be more resourceful. I am looking at other positions, attending more networking events, volunteering, and so forth. This is definitely not the time for any of us to be complacent. Are you being resourceful during this recession? I've been engaged for almost 18 months now, and have made zero progress on wedding plans. It seems that the idea that weddings are really for your family and friends and not for yourself is especially true in my case, because everyone is getting antsy. People bring it up so often now that my guy and I agree that we wish we had never told anybody about our engagement. My guy and I are very busy people. We barely have time to eat and sleep, let alone plan a wedding. We also aren't very big on the idea of having lavish wedding plans, or spending tons of money on one day, or any other traditional notion of weddings and marriage. We thought at first this would make it easier to plan something, but being unique takes much more time than blindly following the rules laid out in a wedding planning for dummies book. The thing is, though, that we're completely okay with waiting. Nothing is going to drastically change for us by getting married, so we're not in any rush to have a wedding. Unfortunately for us, everyone else seems to think it's a huge deal. They're pondering what's taking so long -- Are we commitment-phobic or otherwise freaking out about the idea of getting married? Are we not financially secure enough to afford a wedding? Are we secretly broken up and just don't want to tell anybody? The speculation and constant questioning is driving us up the wall. We don't want to be rushed into something just to make everyone else happy, but we're also pretty tired of the drama we're creating by not making this enough of a priority in everyone else's eyes. Does anybody else find that your wedding was more about your guests than your relationship? Did you feel pressure to get it done right away? I write books for teens. I’m finding that my recently-released civil rights era novel sparks conversation about people’s experiences of race, now and in the past. I’m excited by this dialogue. I want it to continue. I’m thrilled to have created a book that resonates with people. Maybe all the nice reviews I’ve gotten are going to my head, but the great reception for my work makes me want to do this again. And again. The thing is, I know I’ll write other novels. As a matter of fact, I’ve already written some that are in various stages, even approaching publication. But they’re not all historical, not all about race, and they don’t even all star black characters. Is this a problem? I’m starting to be worried that it is. From an artistic perspective, we’re taught to tell the stories that speak to us, regardless. Self-editing for social reasons is a no-no. Self-editing at all is a worry for later. Well, it’s later. And from a career perspective I believe these things do matter. I don’t mind bucking the mold of “black author,” for my own sake, but I also think that my art stops being just about me when it is on its way to an audience. That’s enough beating around the bush. Here’s the crux of it: As a black woman writer, do I have an obligation to write stories about black women? Black girls? Black people in general? I’m curious what other people, readers and writers, think about this issue. If you could have dinner with three women, from the past or present, who would you choose and why? Bridget is a senior at Vassar College, studying Political Science and Women's Studies. She loves watching movies with her younger brother and playing rugby for her school. Ever since being abroad in Denmark for a semester, I've been fascinated how language serves as a key to understanding the fundamental values and viewpoints of a society. For instance, Denmark's value of treating people equally is reflecting in their language, as there is no formal way of addressing someone, unlike how Spanish has “Usted” and German has “Sie.” On a functional level, knowing a little Danish went a long way for me in my daily errands, navigating streets and reading menus. Still infected with the traveling bug, I decided to take two German Studies classes last semester. I took The Culture of Transparency, a course tracing the dark undercurrents of Germany's totalitarian history and its utopian aspirations as a new international locus of culture, and a course called Marx, Nietzsche, and Freud, which drew connections between these influential thinkers, studying their analysis of political systems, entire disciplines, and even the death of God. What drew me most to the works of these authors and thinkers was how they were “masters of suspicion.” They exposed the hidden dark and powerful forces like economic motives, unconscious desires, and the will to power that shapes our reality. In class, I was deeply jealous that the German majors were able to read the original text, extracting deeper meanings in the words' charged German context. By not fully grasping the cleverness of the German language and the author's specific word choice, I felt like I was reading a muted down version of masterpieces. Too much was being lost in translation. Curious to know more about a culture that produces such great works like “Death in Venice” and “The Three Penny Opera,” I've dedicated myself to studying the German language intensively. Class is everyday with an extra four drill sessions a week, where a fellow German student does blitz drills to get us more comfortable speaking the language and conjugating verbs. It's not easy memorizing the words for the multitude of German sausages and meats, but I am proud I'm pushing myself out of my comfort zone and I am not just 'coasting' my senior year. Also, I'm so excited that I can finally watch all the great German post-new cinema without relying on subtitles. And come April, I'll be reading Kafka's work in its original text! Do you speak a second language? Have you ever been able to experience foreign literature or film in its original language? There are times during conflicts when lines of communication break down. Even if one or both parties want to make things work, there may be issues they cannot compromise on. We see this in negotiations between countries, religious, ethnic and political groups in the news all the time. In our own relationships with family, significant others, and friends, we run the risk of "hitting a wall" when it comes to compromise. In my own experiences, I have learned to accept when countless negotiations just don’t work anymore, distance becomes the best option. There is one member of my family whom I will always love and be there for, but I am giving him plenty of space because of this issue. He doesn’t seem to understand the difference between well-intentioned advice and insults, which causes constant friction. I have tried to make peace without compromising myself or the truth. Up until this point, my diplomatic efforts have been spurned or ignored completely. He is currently not speaking to me, but it isn’t the first time he's given me or other family members the silent treatment. Months and even a few years have gone by with complete avoidance. Instead of pressing him to make peace, I have adopted what seems to the best course of action, which is staying out of his way. Even in sad, upsetting situations like these, I find myself learning to be even more patient and realistic than I already am. When I came to the realization that a long-term friendship could be over for good, I began remembering how communications between us started to fall apart. I knew things were bad when I kept defending my actions and intentions to someone I thought understood me. Even after I thought we came to a resolution, the same misunderstandings came back to the surface, with the same tensions and resentments accompanying them. Temporary or permanent distance may be the only options we have, but I know that whatever happens, it will be for the best. How do you deal with breakdowns in communication? I've always found tattoos to be a great way of expressing yourself, documenting things that are important to you, and a source of inspiration. I got my first tattoo over a year ago, and am ready for my next one. The image I want for my next tattoo is the symbol for the mantra om mani padme hum. I've found many sources that speculate about the exact meaning, but there seems to be a consensus that it essentially comes down to compassion, including self-compassion. Everyone who knows me fairly well knows that compassion for others and empathy drives everything I do. My work, my hobbies, how I treat my friends and strangers, all of it. I do not, however, treat myself the same way. I have a lot of confidence when it comes to my abilities, but I do not show myself very much compassion or love at all. I don’t eat as well as I should, I don’t try hard enough to get good sleep, I don’t work out as regularly as I should, I beat myself up constantly over the stupidest things, I blame myself for everything wrong that happens around me. Basically, I’m a big ball of negativity when it comes to myself. So, I wanted to get this tattoo as a regular reminder that there is strength in the compassion I give to others, and that doing more of that can only help. But I also need to remember to give at least that much compassion to myself. For me, finalizing the placement is just as important as the design. I currently have a tattoo on my back, and I forget it’s there. 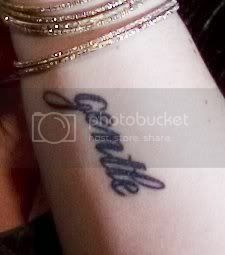 Because of what this tattoo means to me, I want to get this one on my forearm (like Alanis’ breathe and gentle tattoos). I want it somewhere visible, so it can really serve as a daily reminder, and my forearm seems like the best place for that. Do you have any tattoos? What are they of and where do you have them? Recently, I’ve been to several writers’ retreats and conferences that involve eating in a cafeteria for lunch. Writers, by nature, tend to be introverted people, often with past experiences of being outcast in some way — but shyness and the lunchroom simply don’t mix. It’s come up in my conversations with people at some of these functions that no matter how old we get, it can still be awkward to walk into a cafeteria, tray in hand, and have to decide where to sit. After repeated experiences entering the dining room solo, you learn that it’s best to arrive in packs. You wait to get in line until you see a friend, so you automatically know who you’ll be sitting with. Or, you cultivate your social skills enough that you can link up with new acquaintances in the lunch line. You do whatever you can to avoid starting from scratch when you walk in. Inevitably, the experience throws us back to our younger days, when navigating the lunchroom was an everyday occurrence. It reminds some of us why we’re glad to have grown up, after all, so we don’t have to deal with this kind of stress all the time. It’s amazing how old uncertainties can linger. These writer friends I’ve made are, for the most part, bold and self-assured individuals who are making their mark on the world in various ways. Some work in libraries fighting censorship and helping little readers find the books that will blow their minds. Some are schoolteachers, who face the toughest audiences on a daily basis with confidence and calm. Yet, we feel nervous about sitting at big tables, just like when we were kids. In honor of Women's History Month, this month's Friday Forums will have that theme. This week we're asking you, who are the women that inspire you? What is it about them that you find so inspiring? These women can be living or dead, famous strangers or close friends, etc. We'd love to hear your answers. Don’t you just love it when someone sends you a handwritten letter, card, or postcard in the mail? When I see it stacked with the usual bills and junk mail, it is like shining beacon from the past. At the very least, it reminds me of a time when the Internet was not the “end all or be all” when it came to communication. Now, I mostly get emails, instant messages, tweets (on Twitter), and wall posts on Facebook, which helps me stay connected to people. Don’t get me wrong; I couldn’t operate without the Internet. It is essential in my work and research, and it makes life so much easier. I’m sure most of you would agree that the World Wide Web is here to stay, but when I receive something handwritten from friends or family members, I am especially touched. Admiring or bemoaning the sender’s penmanship and feeling privileged that someone made the effort to create their words with pen (sometimes pencil) and paper are two reasons why I hope we go back to it every once in a while. I plan to take my own advice and send a letter or postcard to someone I care about. If it is a letter, I will explain what I’ve been doing to someone who has not seen me in a while. I would make the correspondence interesting of course, without embellishing the truth. A postcard would require a shorter and more concise message, with the front of the card being as eye-catching as the writing itself. I tend to over-think little things like which stationary to choose, but sometimes it is worth it. I know that going back to pen and paper can feel like a step backwards to some, but I think that being nostalgic for the past is not a bad thing. I hope that wherever she is, Jane Austen agrees with me. Do you think we are too reliant on our computers and the Internet for everything? What are your thoughts on sending and receiving handwritten correspondence? If you've been keeping up with my posts, I'm sure you've realized that I'm a bit lost right now. In search for answers, I made a collage a few weeks ago using the same process we use at TWM's Visioning Workshops. Some things stuck out to me right away and some I still haven't figured out. But the things I've figured out, I'm starting to take action on. One of the themes in my collage is nature. I've got trees, grass, flowers, and dirt roads running through the entire thing. Given my feeling lately that I've been spending entirely too much time in my living room, I'm pretty sure these images are a reflection of that desire to go out and explore. There are also a lot feet -- bare feet, pampered feet, active feet that are running and jumping. I think this is probably connected to the same idea of getting out there, but I think it's also about taking care of myself. Exercising, pampering myself, finding time to be peaceful... it all goes back to paying attention to my own needs. This really drives home the main thing I got from my collage: Me. I've now made several collages, and this is the first one that's all about me. In the past, they were about relationships with other people, life changes, career, etc. But this collage doesn't really have any of that. It has affirmations, images of some of my passions (music, writing, books), and things I take to mean quiet time with myself (blankets, hot chocolate). I've always struggled with making time to nurture myself, but I've been trying much more since making the collage. I've started to work out again, and have been walking and running a lot. My guy is on a diet, so I've started to eat healthier just by being around him. I've also become more conscious of how I spend my time and want to decide what's still important to me and what I can afford to spend time on. These next few weeks will be a bit bumpy, but at least I'm paying attention to the road signs again. 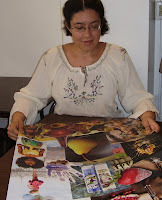 Have you ever made a visioning collage? If you're interested, be sure to check out TWM's next Visioning Workshop later this month. I love hearing people's stories -- the strange, exciting, dramatic, crazy adventures they've had. It's such fun when, in conversation, you happen upon a topic that reminds someone of a moment that happened months, years or even decades ago. I find a special joy in these moments when they occur with people much older than I am, who lived through the moments I read about in history books. In the few weeks since my book came out, I've found myself talking to many about the 1960s. (My novel is set in 1968 Chicago.) When I describe the book to people who can remember that time, they light up. They always want to tell me where they were and what they were doing. I talked to people of different races who participated in civil rights demonstrations, and one woman who desperately wanted to, but was too afraid to step forward. I talked to a white woman who had attended Black Panther Party political education classes, and another who traveled to register black voters in Mississippi. Amazing stories! Some of these revelations came from people I've known for years. Yet, I had no idea about this corner of their pasts. Now, new doors have opened between us as a result of these conversations. I've discovered stories lying under the surface that were there all along, right under my nose. I would've loved to hear these anecdotes while I was writing the book, hungry for material, emotion and experiences to weave into my characters. So, I find myself wondering why these things never come up. I don't quite know the answer, but I think it's mostly because I never asked them. And many people aren't comfortable sharing certain things when they're not asked. Especially when it comes to topics related to race, I think. Or maybe it's the 1960s itself that's become taboo. All the progress we've made in civil rights and race relations seems to have made people feel like it is something that no longer needs to be talked about. Not so, friends. What were you doing in 1968? 1978? 1988? 1998?